A Vampire Romance: Paris Stories is one of the latest releases to the hidden object genre. Having played this game I feel like I made a trip to the past due to the way the game looked and played. The story reminds a bit the Twilight movie story. 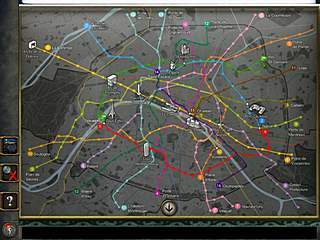 You will learn how to use subways just by playing this game. In this game you play as a young girl who comes to Paris to study art. There she meets this mysterious guy, and as you can guess from the title, things get romantic but complicated. So if Twilight story wasn't enough for you, you can also enjoy this version of the girl-meets-vampire story. Now I have to explaain why I said before that it felt like I travelled back in time. 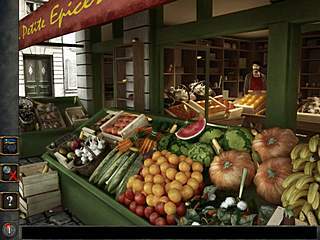 The game basically consists of good old hidden object levels and mini-games of different kinds. There is also a part with iteractive searches, but it isn't that big part of the game, and it isn't that challenging too. You don't have to think hard where to use what and how to get somewhere. Everything is pretty easy here. The hidden object levels are many here. You will get the list of items at the bottom, and it is one of the types of lists when you don't get the whole thing at once, but rather, it adds new items as you find the one that it shows. The scenes of the hide-and-seek levels are so from the past. The graphics are extremely simple, and it is usually very easy to find everything. There are hints though. You can replenish them by collecting stars all over the game. One thing that really enjoyed is that you have to be acquainted with the Parisian subway. You use it every time you go somewhere else.It will be much easier for those who do have to use the subway, and also very useful for those who might ever need to use it for the first time. The mini-games are all kinds of puzzles. They are very short and easy. The game does give lots of explanation before you play anything. One thing that was very annoying is that you have to click the arrow or "x" if you want to go to the game from the conversations or help. It seems like not important, but it becomes important after many times of doing it. So if Twilight story wasn't enough for you, you can also enjoy this version of the girl-meets-vampire story. This is A Vampire Romance: Paris Stories for Mac review. Download this game here.